Ardhanarisvara (also known as Ardhanari and Mohiniraaj) is an androgynous Hindu deity consisting of Shiva and his consort, Parvati (viz. Shakti, the active, creative female energy). Together, these unified divinities represent the synthesis of masculine and feminine energies in the process of creation. In Hindu iconography, Ardhanarisvara is depicted as half-male and half-female, split evenly down the middle upon a central axis. This Hindu deity symbolizes the inseparability of the feminine aspect of the divine with the male principle of God. The image of Ardhanarisvara is one of the most distinct in India, and represents either the harmonious male-female essence divinity or else the ineffible genderless nature of of God beyond human distinctions. Ideally, Ardhanarisvara is said to represent the perfect unity and equality of male and female in the creation of the cosmos: in this figure, Shiva and Shakti are non-dual and inseparable. Ardhanarisvara is considered an anthropomorphized manifestation of Parasiva, the abstract, formless Shiva comparable in His theological properties to Brahman, the monistic essence of the universe. The term "Ardhanarishvara" is a combination of three Sanskrit words: Ardha, nari, and ishvara, meaning respectively, "half," "woman," and "Lord" or "God." 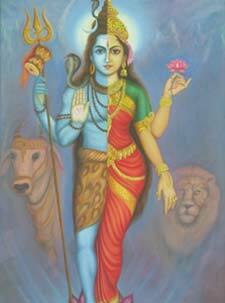 Thus, Ardhanarishvara means the "Lord whose half is woman," or "Lord who is half woman." Some scholars translate the term to read as the more equal, "half male" and "the half female." However, this translation has largely been discounted, since it implies dvaita, or a duality of existence, which would stand in direct contradiction the Advaitic philosophy that informs much of Shaivism. Additionally, some feminists interpret the "Lord who is half woman" to suggest the inherent maleness of the divine, in accordance with the typical Shaivic advaitic view, and therefore his perpetual supremacy over the female aspect of reality. The earliest Ardhanarishvara images date back to the Scytho-Kusana period, around the beginning of the Christian era, or a short time before. The oldest of these images is a small, red sandstone Kusana stele, which has been dated to circa 35–60 C.E. This piece pictures Ardhanarishvara, identifiable by way of a central axial division of male and female halves, standing alongside three other deities, thought to be Vishnu, Lakshmi, and Kartikeyya. Other accounts suggest that Shiva, under the label of Oesho, appeared in androgynous form on some coins during the late Kusana period. This may be taken to suggest that the notion of the male-female deity was popular very early after its appearance. Ardhanarishvara has remained one of the most prevalent forms of the Divine in Indian art ever since. Historically, Ardhanarisvara seems to be a continuation of Indo-European Aryan motifs of androgyny dating back to the Vedic period. One of the earliest examples of such a pan-sexual deity is the Vedic Dyava-Prthivi, who generates the universe by dividing into distinct halves: Dyaus, the fatherly sky god and Prthivi, the motherly earth goddess. Similarly, Rg Veda 3.38.4 describes how Visvarupa, the androgynous Bull-Cow god, can self-generate. This motif was continued on in the Brhadaranyaka Upanishads, wherein the description is provided of a single body in the shape of a man. For want of companionship, this man creates the universe by splitting his body into two halves, husband (pati) and wife (patni). Each of these legends seem prototypical of Ardhanarisvara. Ardhanarisvara is most identifiable by way of his/her differentiation into male and female halves along the central vertical axis. Barring a few exceptions, the right half of his/her images comprises male anatomy and the left that of the female. A few images, obviously influenced by the Shakta sect that gives preeminence to the power of the goddess Shakti, have reversed placement of the male and female torsos. The male half of Ardhanarisvara is characterized by the typical features of Shiva. The head usually bears the crescent moon and snake ornamentations, as well as half of a mustache. Upon his ears, he wears traditional male earrings. His physique is very masculine, with a flat pectoral muscle, a broad shoulder, and a wide waist, as well as a muscular thigh. Furthermore, the male side is ornamented with all the typical accessories of a Shiva image, such as draped garments or a tiger-skin around his waist. Canons of iconography suggest that the right side of Ardhanarisvara should be covered with ashes, or else painted red to depict Shiva's Rudra aspect. Some images from North India depict the male half with tumescent genitalia. The female half of the image is distinguished by a different hairstyle, which is either held in a braid or in a bun. Her forehead bears a half tilaka, or dot (bindu), placed beneath the third eye. Her eye is larger than Shiva's, and the left ear wears earrings designed for women called valika. On the whole, the left side is more curvaceous, with a smaller waist and fuller hip as well as a rounder, well-developed breast. Her ornamentation is greater and decidedly female, including draped silk clothing which reaches her ankles, saffron body powder, anklets, bracelets and henna coloring her left foot or hand. This half of the body is typically colored saffron or parrot-green. Several features are shared between the male and female sides, including the navel, chest ornamentations, bracelets, anklets, neck pieces, rings, and belts. A halo often illuminates the entirety of the deity from behind its head. Sometimes the male and female halves share a third eye. From the Gupta period onward (320-600 C.E. ), the sacred thread worn by twice-born castes appears upon the deity. Often, it takes the form of a serpent and crosses the upper torso of both the male and female halves. The Ardhanarishvara image may be endowed with two, three, or four arms, although they sometimes number as high as eight. Two-armed Ardhanarisvara images are the earliest. In these images, the diety holds the male hand in the abhaya mudra, the gesture in which the hand faces toward the onlooker with fingers straight, serving to impart fearlessness. The female hand carries either a mirror (darpana) or a blue lotus (nilotpala). Four-armed images are usually divided at the elbows, with one male hand remaining in the abhaya mudra while the other most commonly holds a Parasu (axe) or trident. This hand can also hold a rosary, sword, club, thunderbolt, skull, or noose. On four-armed images, one arm on the female half is bent and rests on Shiva's vehicle, the white bull Nandin, or else is held in the kataka mudra, a gesture of intellectual engagement. These hands many also hold the water pot (Kamandalu), a mirror, the lotus flower, the lute (or vina), a drum (damaru), or a small parrot. When three-armed, two of Ardhanarisvara's arms are shown on the male side while only one is placed on the female side. In sculpture, Ardhanarishvara is depicted in a number of bodily postures. The most common is the tribhanga, a posture with three mild curves: One in the head, which leans to the left, another in the torso, which leans to the right, and the third in the right leg, which leans to the right. Also recorded are the atibhanga, a posture with more pronounced curves, and the abhanga or sthanamudra, a straight posture. Sometimes the deity is seated upon a pedestal, such as the lotus (padmasana). While significant numbers of seated images of the deity can be found, they are not nearly as common as those in which she/he is standing. Modern images of the deity in popular culture pay closer attention to the contrasting complexions of his/her halves. The male half usually takes on the bluish tone typical of Shiva, while the female half is golden in color. Parvati is often pictured in proximity to her lion vehicle, while Shiva is accompanied by the white bull. The images are also often placed against a familiar backdrop, such as the Himalayas, where Shiva meditated upon Mount Kailasa. The Ganges, meanwhile, is commonly shown flowing from Shiva's head and into these mountains, in congruence with the Hindu legend of that river's origin. Ardhanarisvara explains a fact of biological necessity; that is, the pairing of male and female in order to create life. The hathayoga tradition attempts to put this noble idea into practice by having a yogin or yogini focus upon Shiva and Shakti as this interdependent, undivided whole. With this in mind, the goal of the practitioner in the hathayoga system is to achieve sustained experience of Ardhanarisvara, thereby recognizing his or her true nature as "divine, non-dual, and androgynous." In doing so, the kundalini-Shakti can readily be drawn upward from the base on the spine to Shiva's sahasrara chakra at crown of the head. Once this yogic action is performed, Shiva and Shakti are united, and the yogin can proceed to the final stage of liberation, identity with the supreme Parashiva, which is said to be characterized by formlessness and the absence of gender. However, some feminists have disagreed with the assertion that Ardhanisvara is the epitome of sexual unity and equality. Such critiques begin by pointing out that Ardhanarisvara refers to the "lord who is half woman" as opposed to a "half-man, half-woman." This phrasing suggests the inherent male nature of the deity and privileges him with the status of isvara—"god," "lord," or "master;" Parvati meanwhile, is simply "woman" (nari). It has also been noted that the left side of the body is generally thought to be subordinate to the right in Hindu doctrine and iconography. Thus, the male right side of Ardhanarisvara gains another token of implicit privilege over the female side. Furthermore, the aforementioned concept of liberation based on union with Parasiva, towards which yogic practitioners' experience of Ardhanarisvara serves as a stepping stone, has been labeled as a male-identified variation of non-duality. As a result, Shakti's manifestation is said to be quelled entirely, and so she loses her ability to act, rendering her no different from Shiva, the inactive principle. Thus, at the highest level of spiritual attainment, the female half of Ardhanarisvara is subsumed into its male half, which seems incongruent with the notion of equality of the sexes that the deity supposedly symbolizes. ↑ Frederique Apffel Marglin, Wives of the God-king: the Rituals of the Devadasis of Puri. (Delhi: Oxford University Press, 1989), 216. ↑ Ellen Goldberg, The Lord Who Is Half Woman: Ardhanarisvara in Indian and Feminist Perspective (Albany: State University of New York Press, 2002), 1. This page was last modified on 12 April 2016, at 15:40.